Vienna, also described as Europe's cultural capital, is a metropolis with unique charm, vibrancy and flair. It boasts outstanding infrastructure, isclean and safe, and has all the inspiration that you could wish for in order to discover this wonderful part of Europe. 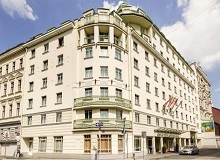 The air-conditioned rooms at Sofitel Vienna Stephansdom have a minibar including mineral water and fruit juices is free of charge in all rooms. Free WiFi is available in the entire hotel. The whole hotel areas are reachable by wheelchair. 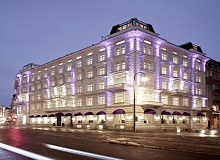 Conveniently located in the city center, Park Hyatt Vienna offers the perfect starting position for those who want to explore the imperial and magnificent city of Vienna. The sans souci wien is the answer to every unspoken desire for an urban retreat right at the heart of vienna's cultural and artistic centre. Directly adjacent to vienna's museums quarter, it is a haven of relaxation with a multitude of delights for the senses, and a place of art. 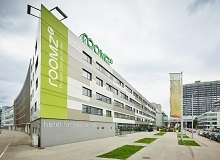 Roomz vienna is a hotel that has succeeded in merging the dynamic requirements of contemporary, quality-conscious travellers with an intelligent and economical range of services. This Budget Design Hotel meets all expectations and is characterised by freshness and colour in its design, image and informal atmosphere. You can rest assured that you will find exactly what you need at the Austria Trend Hotel Ananas. 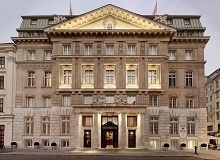 Austria's largest four-star hotel has it all and a little bit more, ensuring that your trip to Vienna will be a memorable one. 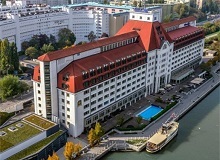 This Hilton hotel in Vienna overlooks the River Danube and is in walking distance of the Metro Station Stadion, linking to the city center. 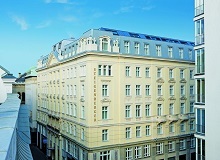 Vienna International Airport is just a 20-minute drive away. Combining a magnificent location in the heart of the city with great amenities and services, Hilton Vienna is the place to stay when visiting the Austrian capital. 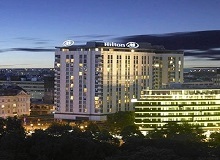 Novotel Wien City hotel is a modern wheelchair friendly 4-star hotel offering bright, comfortable rooms. Two children under the age of 16 can stay in family rooms free of charge. The spacious, air-conditioned rooms provide a flat-screen TV, a minibar, and tea and coffee-making facilities.